For Veterans Day I wrote about my great-great-grandfather Cornelius Godshalk Sellers and some of the events in his life, including his experiences as a New Jersey volunteer in the Civil War. I mentioned that I was waiting on a copy of Cornelius' payment voucher from 1865 and that I would then have a copy of his signature. One of the reasons this was significant to me was because it would allow me to put together six generations of Sellers signatures — Cornelius was the only one I was missing. Next goal: Find a signature of my fourth-great-grandfather, Abraham Sellers! In 2008 StoryCorps, a nonprofit oral history project, launched the National Day of Listening, a day when Americans are encouraged to make time to record the stories of family members, friends, and community members. It now regularly takes place on the Friday after Thanksgiving — which means today! StoryCorps has recording booths in some cities in the United States, and conducts mobile tours, where people can come and record interviews. These must be reserved ahead of time. It also has recommendations for equipment and resources for people to conduct their own interviews. Take some time today to interview a relative and record that person's story. Better yet, make it a family event and have multiple interviews! Save family stories and pass them down to other family members. Today's Saturday Night Genealogy Fun event from Randy Seaver was interesting, so I thought I'd participate. He asked people to create a timeline for an ancestor and then post about it. So here's my entry. 1) Have you created a Timeline for one of your ancestors using a genealogy software program (e.g., Family Tree Maker, RootsMagic, Legacy, Reunion, etc.) or an online family Tree (e.g., Ancestry Member Tree, FamilySearch Family Tree, Geni, MyHeritage, etc. ), or in a spreadsheet (e.g., Excel) or in a word processor table? 3) Show us your Timeline creation, and tell us how you did it. Which program/website did you use, the process you used, and how you captured the images to display your timeline. 1) and 2) I have created timelines previously, but I put this one together tonight. 3) I used Family Tree Maker 16 (I've seen no need to upgrade past that version) and created a genealogy report that included all the facts I had. I then exported the information in an RTF file and did some editing in Word. I copied and pasted from Word directly into this post. (I found it amusing that a timeline with fourteen entries has thirty-eight sources!) Because I did the timeline in a word processor, I don't have any images. Like Randy's timeline, this is pretty plain, but it has all the information and is easy to read. I also would like to add more information, starting with what O.K.S.B. stands for. 4) So I'm sharing my timeline here on my blog, I'll add a comment to Randy's post, and it will show up on Facebook and Google+. I'm covering all the bases. I have continued to watch the new season of Finding Your Roots, albeit in "encore performances" (PBS doesn't really have reruns, right? ), but I find myself continually underwhelmed, both by the stories and by Henry Louis Gates, Jr., himself. It isn't that the family stories aren't interesting — if I thought family stories were boring, then becoming a professional genealogist would have been a bad career move — but the method by which Gates presents the information does not lend itself to suspense. It's hard to get excited when he says, "Please turn the page." Since he is not actually telling a narrative but merely picking out essentially random facts, the "revelations" often seem to be a connect-the-dots puzzle that has not been completed. The overall presentation style does not help. Like an elderly aunt trying to extend her nephew's visit by doling out treats slowly over time, the guest finds himself obligated to stay longer and longer. This sense of deliberate dragging out is heightened by extensive use of bland B-roll shots as filler. How many times can we watch Gates walk slowly across a lawn or a room, gazing soulfully up at the sky or into the distance? Or see yet another nameless researcher in an unidentified repository scroll through yet one more roll of microfilm with no context? Something I have found extremely annoying is when a celebrity asks Gates, "Where did you find this?" Most of the time Gates merely dissembles, but he has actually responded, "I can't tell you that!" Well, why not? What's the big secret? This is PBS, and it's supposed to be educational. Must our education be limited to hearing how great Dr. Gates is, and not how an ordinary person may learn about his own family? Is access to these documents limited to people with big TV budgets? And one more pet peeve. The opening of each episode includes some CG text in the lower left corner of the screen: "A film by Kunhardt McGree Productions . . . ." I hate to deflate Dr. Gates, but these are not films; they are television episodes. Films have plots and narratives, something lacking in Finding Your Roots. Because there is little of substance to to talk about in the program, I thought I would be able to combine commentary on more than episode in a single blog post. I surprised myself with what I had to say about only this episode, so I guess I will have a few more posts covering the program. As several episodes have been aired since my first post, I decided to pick up again with one I watched more recently, coincidentally the one with three Jewish celebrities. As I've mentioned, we have no continuity to follow in the research process, so it's impossible for me to say anything about that. Since Gates declines to let his guests or his audience know about the big secret repository where he finds all of his stunning revelatory documents, I obviously can't comment on that either. Unfortunately, that mostly leaves me with negative observations on some of what Gates says during the program. In "Our People, Our Traditions", Gates presented Books of Life (should I include a trademark designation with that?) to Tony Kushner, Carole King, and Alan Dershowitz. We watched the standard short background on each guest and the slow, painful parceling out of tidbits of information to each of them. I will admit, probably the most startling thing I've heard on this show, or almost anywhere else, was Kushner's recollection of the woman in Lake Charles, Louisiaia, who asked him, "Where are the horns? ", because she truly believed the old anti-Semitic myth that Jews have vestigial horns on their heads. Seriously? In the 20th century? I hope that woman didn't breed. I am so thankful I no longer live in the Deep South. At one point, when talking with King, Gates commented, ". . . like all Jewish Americans have experienced prejudice." Excuse me, but just where the hell does he get off making a blanket statement like that about several million people and passing it off as fact? Am I the only one who noticed that remark? How can he purport to know that every single solitary Jew in America has experienced prejudice? Did he conduct a survey? I sure didn't get a copy of it. In relation to Dershowitz's ancestors, Gates explained they were from Galicia and said it was "now located in Poland." That would be a significant surprise to the many people in what was formerly Eastern Galicia, which is solidly part of Ukraine now. This same segment with Dershowitz included an interesting piece of information I had never heard before. Dershowitz discussed an old Jewish religious law that did not permit observant Jews to travel on a ship on the Sabbhath, which is consistent with what I understand of similar restrictions, such as not being able to drive or ride in a car on the Sabbath. He didn't state when this law was modified, but if it had not been, Orthodox Jews such as my own grandfather's parents would not have been able to make the trip to the "Goldene Medina", because the ship passage took more than seven days and therefore necessitated traveling on at least one Sabbath, if not more. Truly unfortunately, Gates did not quash an old wives' tale regarding immigration when he had the opportunity. King said she had been told that her family's name was changed at Ellis Island. This myth persists today even though many credible and knowledgeable sources have explained why it simply could not have happened. Instead of categorically denying the possibility, though, Gates said merely that it "almost never happened." Why even leave that door open? It NEVER happened. I think Gates and his team may have bitten off a little more than they could chew with this theme. They were apparently unable to trace any of the celebrities' families back very far. I think the farthest he got was to a second- or third-great-grandfather for one person. I noted several instances of missing maiden names on the family tree sketches that were shown. This affected even relatively recent generations, such as David and Mollie Glajman, King's paternal grandparents. 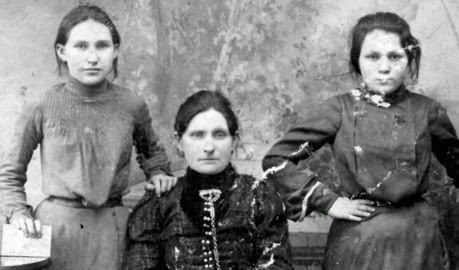 Very few family photographs were displayed and identified; most of the images appeared to be "generic." No really big revelations. And they didn't even talk about the DNA results, apparently because the basic results were very predictable. And since this episode was about Jewish research, have you ever noticed the underwriters for the series? Dr. Georgette Bennett, Dr. Leonard Polonsky, Candace King Weir, the Daryl & Steven Roth Foundation — that's a lot of Jewish names, isn't it? It's still autumn, right? That means the fall issue of The Baobab Tree was published on time! I'm stilll working on getting it out a little earlier, but I'm getting closer. This issue has fewer articles than usual, but they're longer. Nicka Smith, one of my fellow board members for the African American Genealogical Society of Northern California, has written about a promise she made to a cousin to find out what happened to his brother in Louisiana, her unfinished search, and the importance of searching even when it is unsuccessful. 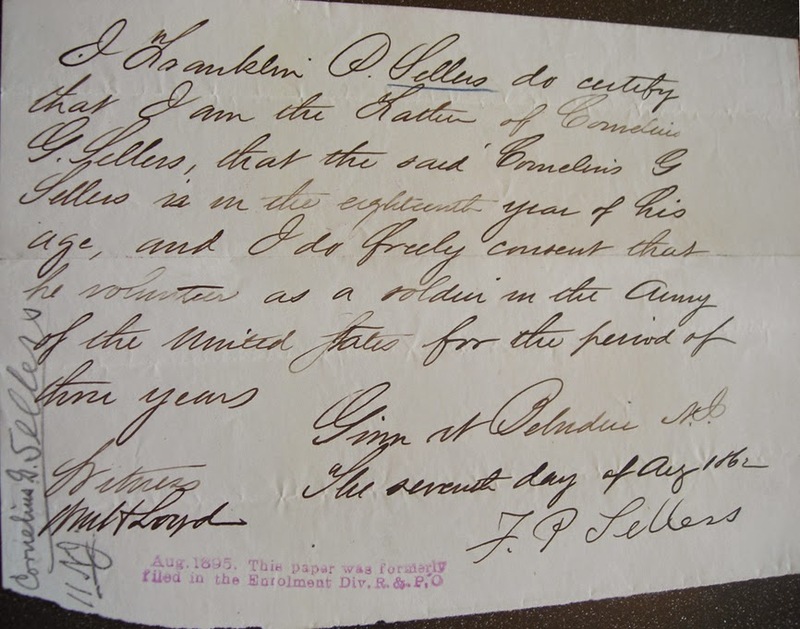 The second article discusses a wonderful archival discovery — a letter that mentioned an ancestor and how he contributed to his community in Ohio. And I shared information about a powerful 18th-century poem written by an abolitionist, a poem that is freely available online. So are you a member of AAGSNC? If so, you should be receiving your fall issue soon. If not, have you considered joining? Visit our Web site and become a member, and you'll get a copy also. 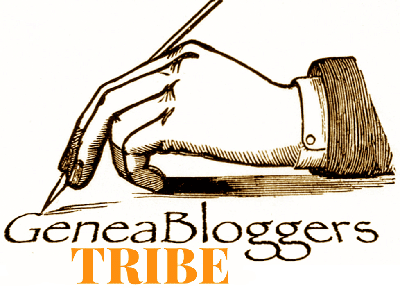 Have you written about your family research and discoveries? Articles for The Baobab Tree are accepted from both members and nonmembers. If you submit an article that is published, you will receive a copy of the issue with your article even if you are not a member. Submissions may be articles, reviews, graphics, or almost anything genealogy-related, both original and previously published, and must be relevant to black family history research. Submission guidelines for The Baobab Tree, including deadlines, are available online. And I'm an easy editor to work with! 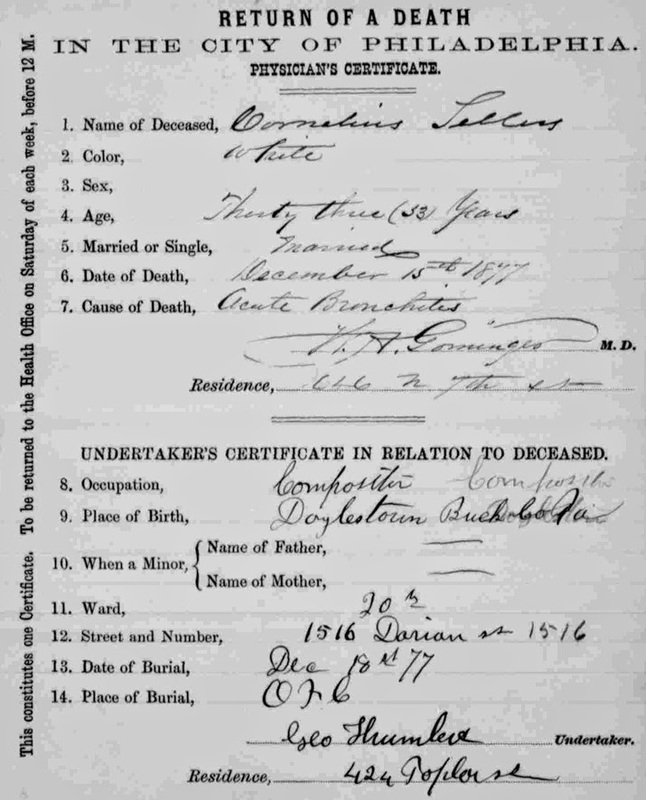 Cornelius Godshalk Sellers, my great-great-grandfather, was born January 15, 1845, in Doylestown, Buck County, Pennsylvania. 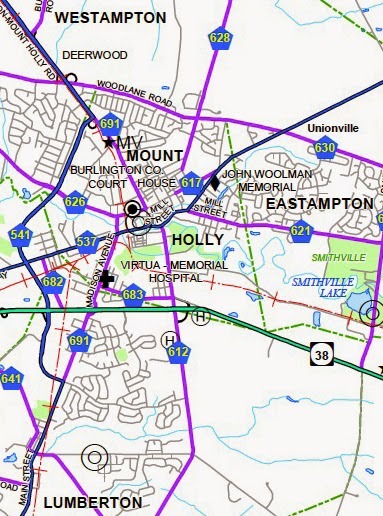 His family was enumerated in Pennsylvania in the 1850 census, but by the time of the 1860 census they had moved to Belvidere, Warren County, New Jersey. When the call came for volunteers to help fight for the United States in the Civil War, he wanted to enlist. Because he was underage, his father, Franklin Peter Sellers, had to sign to give his permission, which he did on August 7, 1862. 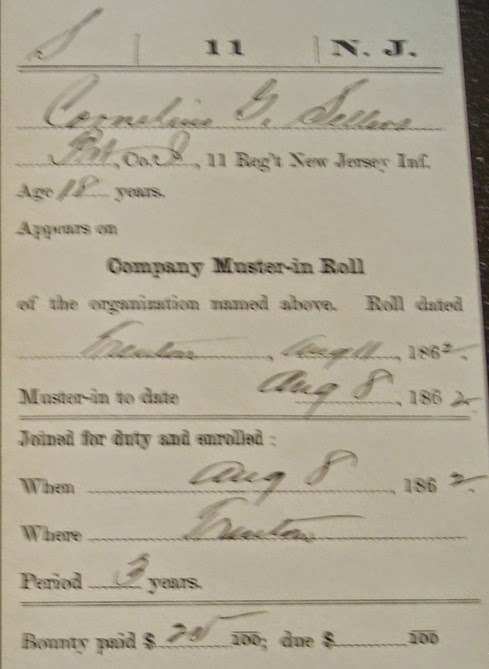 Cornelius enlisted in the 11th New Jersey Infantry, Company I. He mustered in on August 8 in Trenton, New Jersey, where he was paid a bounty of $25. Cornelius was admitted to the hospital at Farfax Seminary in Virginia on June 14, 1863. There he was treated for anemia. He was returned to duty on July 2, 1863, just in time for the Battle of Gettysburg. 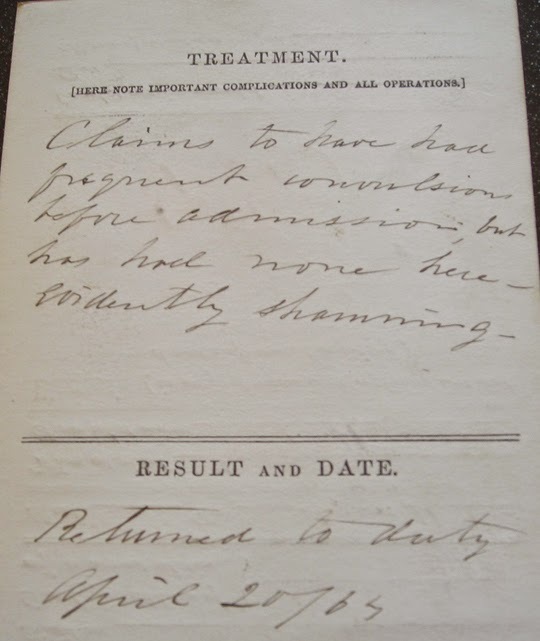 Cornelius was admitted to the hospital again on March 24, 1864, this time in Alexandria, Virginia. 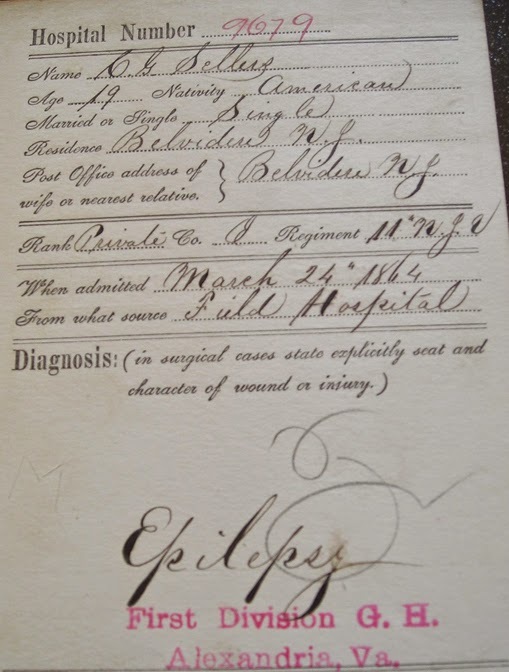 The stated ailment was epilepsy. This time, however, he apparently was not truly ill. The treatment portion of the file states, "Claims to have had frequent convulsions before admission, but has had none here — Evidently shamming." It's possible he was simply tired of fighting. He was returned to duty April 20, 1864, having missed no fights involving his unit. Even with that little incident, he managed to be promoted to corporal on February 23, 1865, having remained a private throughout the previous two and a half years. The Civil War officially ended on April 9, 1865, with the surrender of Robert E. Lee at Appomattox Court House. Cornelius' unit was mustered out a month later, on June 6, 1865, near Washington, D.C. He owed the government $5.45 on his clothing account, but he was due a $75 bounty, possibly for fulfilling his enlistment. 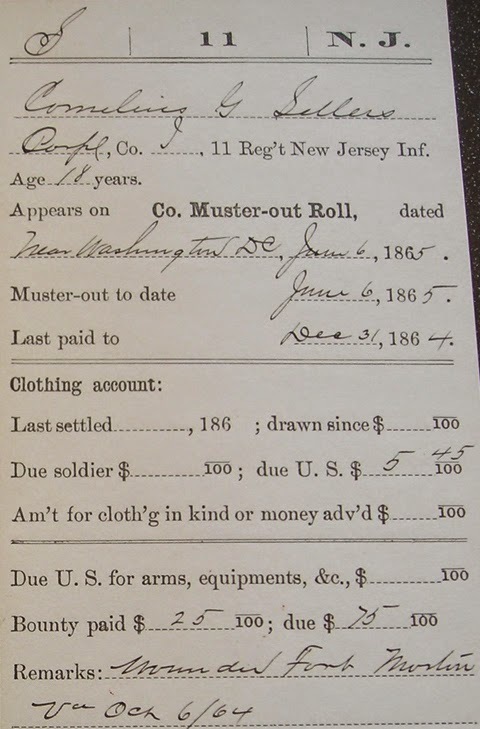 The muster card indicates he was wounded at Fort Morton, Virginia, on October 6, 1864, which does not correlate with the battles I know of. Apparently he did not age during his almost three years in the army, as the card also says he was 18 years old, the same age as listed on his muster-in. Soon after his mustering out he went to Philadelphia, where he set up shop as a printer by 1865, following the same trade as his father. He married Catherine Fox Owen, my great-great-grandmother, in January 1870. 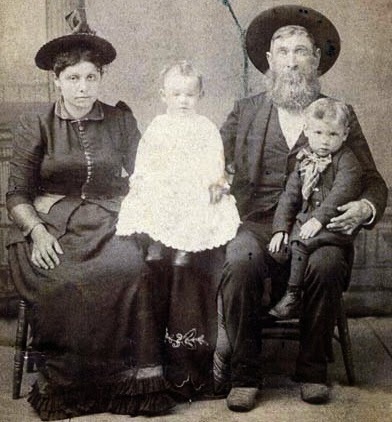 They had at least two children — Cornelius Elmer Sellers (who went by Elmer), born November 7, 1874, and Sarah Owen Sellers, born July 26, 1878. Cornelius was still working as a printer when he died, on December 15, 1877, of acute bronchicitis. He was only thirty-two years old. He was buried in Odd Fellows Cemetery three days later, on December 18. I have just barely scratched the surface of researching Cornelius during the Civil War. 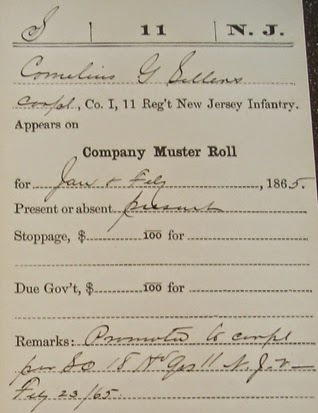 I want to get copies of the morning reports for the unit, which will list his name on the roll and might have more information about the injury at Fort Morton. I have not yet had the opportunity to check for more hospital records. I have ordered but not yet received a copy of his payment voucher from June 19, 1865, for $21.46 — and then I will have a copy of his signature. I don't even know if he had a tombstone or if it survived the destruction of the cemetery. And I would dearly love to find a photograph of him, whether in uniform or civilian clothes. But research is always ongoing, and I am happy I can honor Cornelius on Veterans Day this year. Recently I had the opportunity to attend a presentation on forensic science at the Santa Clara County Crime Laboratory. 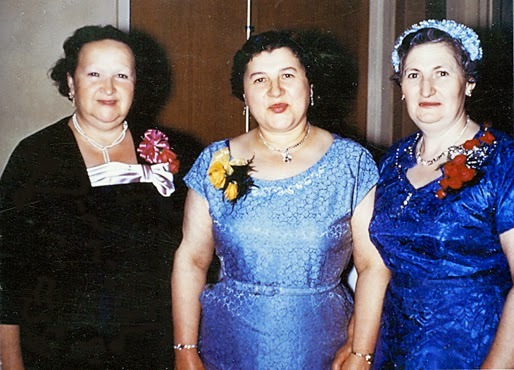 I love watching true crime TV programs that discuss the forensic aspects of solving the crimes, and I am a forensic genealogist, so of course I jumped at the chance. One of the first things the speaker did was explain what exactly forensic science is: the application of the physical and natural sciences to law (emphasis mine). I discussed the meaning of the word "forensic" a few months ago and how Mr. E. used a definition available from online dictionaries but declined to quote the entire thing. As I said then, forensic means “relating to the use of science or technology in the investigation and establishment of facts or evidence in a court of law”, with the fact that it relates to law being an important distinction. Anyone can misuse the term, but that doesn't make her . . . um, those individuals right. So after the definition of forensic science, the audience heard about the crime lab, which is a full-service lab with a staff of 65 people. They work with about twenty different Santa Clara County police agencies but don't do anything with explosives (which are handled by ATF) or biological threats (e.g., anthrax). About 10% of their work is related to collecting evidence, about 80% is analyzing evidence at the lab, and the final 10% is taken up by writing reports on their analyses and occasionally testifying as expert witnesses in trials. Several powerful databases are available to the criminalists working in the lab. For example, CODIS (COmbined DNA Index System) is the generic term used to describe the combination of the National DNA Index System and other criminal justice DNA systems. AFIS (Integrated Automatic Fingerprint Identification System) is the national fingerprint database maintained by the FBI. (I'm in there because I've worked with children in the past, and to do that you have to be fingerprinted so they can check to see if you have a record. I'm clean!) SoleMate is a database of more than 12,500 shoe sole patterns. Fascinating stuff! The speaker showed slides relating to several crimes the lab has worked on, such as the Wendy's "finger in the chili" and Kenneth and Kristine Fitzhugh. I knew I had watched too many forensic shows when I was able to recognize several of the cases immediately just from one slide, before he even said anything! I asked how many people working in the lab were certified and was told that a little under half of the staff are certified in their fields. I also asked specifically about forensic document examiners, because I know one; both forensic document examiners on staff are certified. So what does all of this have to do with genealogy? Well, directly, not much. Indirectly, however, there's some crossover. Certainly, it gave me another chance to kvetch about questionable (and conveniently truncated) definitions of "forensic." But I also got to thinking about how the kind of DNA testing done in crime labs is far more detailed and accurate — because it has to be — than the automosal tests that the general public pays for. If that kind of testing were available and affordable, can you image the kinds of family connections that could be made? Oh, and the forensic document examiner I know? I met her at the Forensic Genealogy Institute, of course.